This dog collar is made of fine quality nylon material, heavy duty buckle makes it hard to break and more secure for your lovely dog, lightweight and very comfortable for dog&apos;s daily life. Nylon fabric, tough but lightweight, waterproof and wear resistant. A carry handle are attached to the collar for easy controlling. Wrapped with a cotton layer, makes it more comfortable for dogs to wear. With a triangular hanging hook to provide attachment points for a dog leash. Great for dog pet training, hiking, walking, running and hunt, etc. 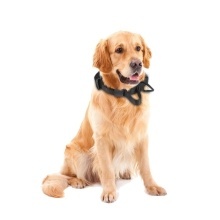 Easy to adjust for all kinds of dogs, perfect gift for dog owners.